The Jargon File describes a wizard as someone who groks something to a very high degree, or the kind of person that builds a polymer concrete CNC machine with a pneumatic tool changing spindle that they designed by themselves. It makes you think that maybe Tony Stark COULD build it in a cave with scraps. It’s a five part video series showing snippets of the build process. The last video gives an overview of the design of the machine. It is all very much in German, so if you speak German and we got anything wrong about the machine or missed anything cool, please fill us in down in the comments. The machine starts with a 1500 kg polymer concrete pour with some steel stock embedded in it. It is then machined within an inch mm of its life as shown by practically zero deviation over its length when measured against a granite block. The wizard then goes on to make his own spindle, get castings made, and more. We liked his flowery kitchen hotplate, which he used to heat the bearings for an interference fit. It added a certain amount of style. Unfortunately the videos don’t show the machine running, but we assume this sort of person is happily building arc reactors, power suits, and fighting crime. They probably don’t have time to film “CNC Bearbeitungszentrum im Eigenbau Teil 5”. Videos after the break. Tony Stark’s J.A.R.V.I.S. needs no introduction. With [Shubhro’s] and [Charlie’s] recent release of Jasper, an always on voice-controlled development platform for the Raspberry Pi, you too can start making your own J.A.R.V.I.S.. Both [Shubhro] and [Charlie] are undergraduate students at Princeton University, and decided to make their voice-controlled project open-source (code is available on GitHub). Jasper is build on inexpensive off-the-shelf hardware, making it very simple to get started. All you really need is an internet connected Raspberry Pi with a microphone and speaker. Simply install Jasper, and get started using the built in functionality that allows you to interface with Spotify, Facebook, Gmail, knock knock jokes, and more. Be sure to check out the demo video after break! With the easy to use developer API, you can integrate Jasper into any of your existing Raspberry Pi projects with little effort. We could see Jasper integrated with wireless microphones and speakers to enable advanced voice control from anywhere in your home. What a great project! Thanks to both [Shubhro] and [Charlie] for making this open-source. 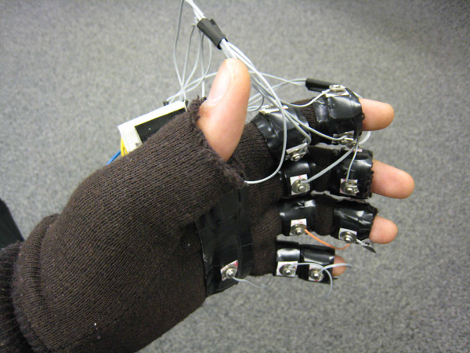 This two handed glove input setup, by [Sean Chen] and [Evan Levine], is one step closer to achieving that [Tony Stark] like workstation; IE, interacting with software in 3D with simple hand gestures. Dubbed the Mister Gloves, the system incorporates accelerometer, push button, and flex sensor data over RF where an MCU converts it to a standard USB device, meaning no drivers are needed and a windows PC can recognize it as a standard keyboard and mouse. Catch a video of Mister Gloves playing portal after the jump.